Studying law has opened up many career paths for me as a graduate. I chose to study at NTU because the facilities at the law school are outstanding. The court rooms provide students with a realistic environment for mooting, which is excellent in terms of practical experience. There is also the opportunity for students to gain legal experience by taking on real cases as part of the Legal Advice Centre pro bono scheme. Nottingham Law School is the only institution outside of London that offers students the opportunity to represent clients in court through the Free Representation Unit (FRU). The University also has an amazing employability team that has strong links with law firms and offer students help with their applications. I find Law a fascinating subject that underpins everything in society. Through studying law I have developed communication and confidence skills from assessed moots and negotiations, team working skills from group reports and commercial awareness due to the business outlook on the course that NTU offer (essential for any law graduate seeking a training contract). In addition to my academic studies I sit on the committee of the LEX Law Society as an Assistant Mooting Officer. Each year LEX runs mooting competitions, primarily to give students the opportunity to practice for mooting assessments. It is my responsibility to assist in the organisation of the competitions, liaise with participants and sometimes act as judge. Being involved with LEX has developed my organisation and teamwork skills, and I have met some excellent people on the committee. In my first year, I was a finalist in the mooting competition and winner of the negotiation competition. These events helped me develop my communication skills, confidence and the ability to think on my feet. The experience stood me in good stead for mooting assessments. I have also attended various networking events through LEX where I have been given the opportunity to meet legal professionals and find out about opportunities available to me. I have undertaken a number of work experience placements, one of which was due to my success in the negotiation competition. 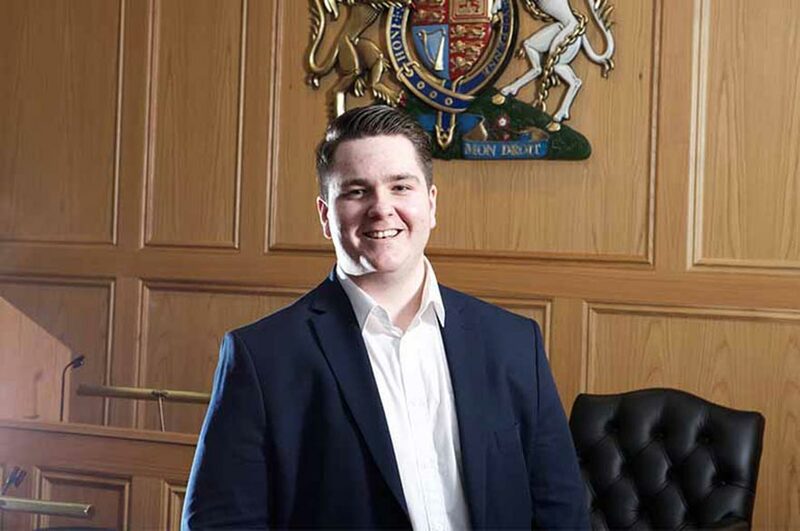 I was given the opportunity to spend time in the Nottingham offices of Shoosmiths and do tasks that a solicitor normally would, such as drafting emails to clients and evaluating the validity of certain contractual clauses. The placement helped me to develop my commercial awareness, and enlightened me to the commercial nature of a law firm and the emphasis that is placed on maintaining good client relationships. My best memory at NTU has been representing the University in an external mooting competition in Belfast (Queens University Belfast). As 1st year students, we progressed to the quarter finals, beating 3rd year teams. We missed out on the semi-finals by a single point against a team of post-graduate students. After the competition, we were invited to a 3 course meal in a nice restaurant in Belfast. Studying law has opened up many career paths for me as a graduate. Because of the subject’s professional basis, and the fact that the subject is both academic and practical, employers in all sectors often seek law graduates. Personally I aspire to be a commercial solicitor when I graduate, working alongside business clients.